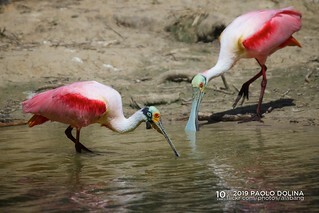 The roseate spoonbill (Platalea ajaja) feeds in shallow fresh or coastal waters by swinging its bill from side to side as it steadily walks through the water, often in groups. The spoon-shaped bill allows it to sift easily through mud. It feeds on crustaceans, aquatic insects, frogs, newts and very small fish ignored by larger waders. In the United States, a popular place to observe roseate spoonbills is Smith Oaks Bird Sanctuary in Texas.